Lowest prices all the time, guaranteed! If you find a better price, let us know. Happy Camper Quilt bedding by C & F Enterprises has animals, including moose, deer, and bears along with fish, trees, and pine cones displayed on rustic plaids and checks in reds, browns, greens, and tans. Just the right bedding for your cabin in the woods and a good choice for hunting and fishing enthusiasts. Self binding trim at edge. The quilt reverses to a brown plaid. Happy Camper comes in a set with the quilt and sham or shams. Add your choice of accessories to style your room. Solid brown euro shams and a solid brown bedskirt are offered to complete your lodge setting. Throw pillows add another layer to this bedding set. 100% cotton and machine washable. Pillows are spot clean only. The Happy Camper Twin 2 Piece Quilt Set has animals, including moose, deer, and bears along with fish, trees, and pine cones displayed on rustic plaids and checks in reds, browns, greens, and tans. Self binding trim at edge. The quilt reverses to a brown plaid. Set includes one twin quilt, 64"W x 86"L and one standard sham 20" x 26". We offer the complete ensemble in the Happy Camper pattern by C & F. Manufacturer's UPC code is 008246329381. The Happy Camper Full Queen 3 Piece Quilt Set has animals, including moose, deer, and bears along with fish, trees, and pine cones displayed on rustic plaids and checks in reds, browns, greens, and tans. Self binding trim at edge. The quilt reverses to a brown plaid. Set includes one full queen quilt, 90"W x 92"L and two standard shams 20" x 26". Fits full and queen size mattresses. We offer the complete ensemble in the Happy Camper pattern by C & F. Manufacturer's UPC code is 008246329398. 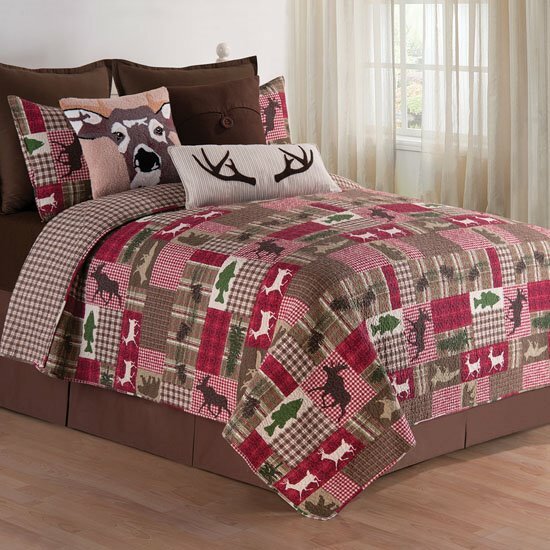 The Happy Camper King 3 Piece Quilt Set has animals, including moose, deer, and bears along with fish, trees, and pine cones displayed on rustic plaids and checks in reds, browns, greens, and tans. Self binding trim at edge. The quilt reverses to a brown plaid. Set includes one king quilt, 108"W x 92"L and two king shams 20" x 37". We offer the complete ensemble in the Happy Camper pattern by C & F. Manufacturer's UPC code is 008246329404. Beige and tan striped pillow with brown tufted antlers. Self piping at edge. 12" x 24". The Hillside Haven Hooked Deer Face Pillow has a deer face handhooked on an 18" x 18" pillow. We offer the complete ensemble in the Hillside Haven pattern by C & F.